Under the direction of Dr. Laura Perna, this project is designed to advance research-based knowledge of College Promise programs in the United States. What is a College Promise program? A “place-based” student eligibility requirement (e.g., living in a designated city, attending a specified school) in addition to, or in lieu of, academic or need-based criteria. Over the last decade—but especially in the past few years—programs meeting this definition have been advanced at local, state, and federal levels as a new strategy for improving higher education attainment. Some College Promise programs are modeled on the Kalamazoo Promise, a place-based scholarship program created in 2005. As articulated by Michelle Miller-Adams and others at the W.E. Upjohn Institute for Employment Research, place-based scholarship programs seek to improve communities by increasing college access and attainment, fostering a college-going culture in local K-12 schools, and encouraging local economic development. Other College Promise programs take the form of the “free tuition” programs that are being proposed and created by state governments and other entities. State-sponsored free tuition programs include the Tennessee Promise and Oregon Promise, as well as New York’s Excelsior Program. College Promise programs are also being established at the local level. As of August 2016, there were 23 college promise programs in California alone; 13 of these programs were established in 2016. As of Fall 2018, there were 43 College Promise programs in California, the largest number of College Promise programs in a single state. Promise programs may have goals beyond promoting college attainment. This project focuses on programs with a goal of increasing higher education attainment. By offering the promise of a financial award to students who meet specified eligibility criteria, College Promise programs have the potential to promote educational attainment, especially among students who would not otherwise attend college. To promote understanding of the design and structure of College Promise programs, we created an online searchable database of College Promise programs. Search the database to find programs with particular characteristics. Universal eligibility programs: award aid without consideration of financial need or academic achievement. Why seven categories? College Promise programs vary in the nature of the promise, target population, eligibility requirements, and other characteristics. Variations in program design are not surprising given the likely benefits of adapting a program to meet the priorities, needs, and other characteristics of the local and state context. Variations in program design also reflect the trade-offs program designers must make when allocating finite resources to achieve different goals. In response to resource constraints, some programs, for example, may provide small average dollar awards to many students, whereas others offer larger dollar awards to fewer students. The seven categories are derived from Perna & Leigh’s (2018) examination of program characteristics. Because of the many differences in program design, programs do not fit neatly into particular buckets. We hope that the seven categories identified in our analyses and featured in this database will provide a useful framework for understanding meaningful differences in programmatic approaches. We began the database in fall 2015, in partnership with the College Promise Campaign and with initial seed money from Civic Nation. Building on data collected by the W.E. Upjohn Institute for Employment Research and the College Promise Campaign, our research team conducted web searches for new programs and consulted other early College Promise websites (e.g., Cities of Promise) to capture data describing key components of College Promise programs operating nationwide. We regularly update the database as new programs are established and program features change. To request that a program be added to the database or to update/edit program information, click here. This interactive map displays the administrative location of College Promise programs that are actively enrolling students. 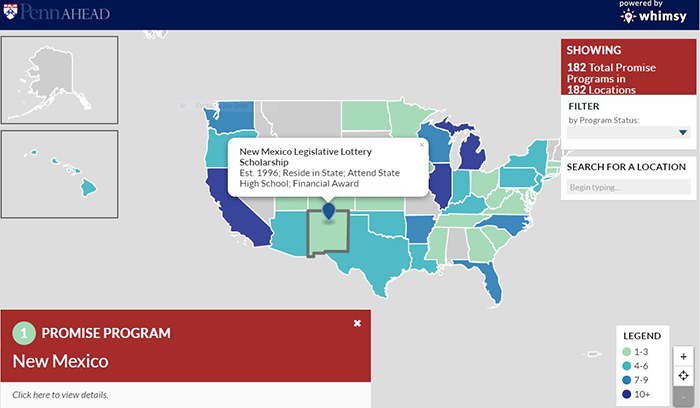 Search by state or program name to learn about program eligibility requirements, financial awards, and program services. For more information, refer to the program website links embedded within the map and explore our searchable College Promise program database.